Dr. Peggy Whitson will receive the 2018 Pillar of Character Award from the Robert D. and Billie Ray Center at Drake University on April 13. 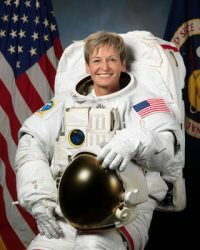 The Robert D. and Billie Ray Center at Drake University has named Iowa native Peggy Whitson, Ph.D., as its 2018 Robert D. Ray Pillar of Character Award recipient. Whitson, a NASA astronaut who holds the U.S. record for total days in space, will accept the Pillar of Character Award on Friday, April 13, at The Ray Center’s All-Star Evening in West Des Moines. An All-Star Evening is presented by Hy-Vee and benefits The Ray Center’s programs, including CHARACTER COUNTS! This award is The Ray Center’s highest honor and is presented each spring to an individual who demonstrates good character as a role model and reflects former Governor Robert D. Ray’s lifelong commitment to civility and character development. Past recipients include Norman Borlaug, Hayden Fry, Dan Gable, Fred Hoiberg, Shawn Johnson, and Ashton Kutcher. Whitson recently flew on Expedition 50/51 aboard the International Space Station and participated in four spacewalks (bringing her career total to ten). With a total of 665 days in space, Whitson holds the U.S. record, placing eighth on the all-time space endurance list. The Iowa native also completed two six-month tours of duty aboard the station for Expedition 5 in 2002, and as the station commander for Expedition 16 in 2008. She accumulated 377 days in space between the two missions, the most for any U.S. woman at the time of her return to Earth. More information about Dr. Whitson and the Ray Award is available at www.AllStarEvening.org. The Robert D. and Billie Ray Center provides character and leadership development strategies to improve civility and develop ethical leaders throughout the world. Through public awareness and programming grounded in research, The Ray Center features two programs, CHARACTER COUNTS! and Excellence with Integrity. Our initiatives benefit people of all ages and are easily adaptable for families, schools, workplaces, athletic teams, and organizations. Additional awards are annually presented by The Ray Center at the Iowa Character Awards each summer.